I’ve had an obsession with apple and blackberry crumble ever since I saw Granny Pig make it on ‘The Blackberry Bush’ episode of Peppa Pig. And I’m not one to resist a craving. Cut apple quarters into three. Pop butter, brown sugar and lemon juice into a large-ish pot, heat until butter is melted and bubbling. Toss in apples, and cook, stirring occasionally, until apples have begun to soften and the house smells of sweetly. Take off the heat and gently stir through the blackberries, taking care not to break them up too much. Combine flour, baking powder and almond meal in a bowl. Add chopped butter, and rub together until mixture resembles coarse crumbs. Stir through brown sugar. (feel free to add some flaked almonds at this point, if you choose). Pour apple and blackberry mixture into a casserole dish, top with crumble and pop in the oven until the apples are tender and the crumble is golden and crunchy. Heat cream and vanilla bean gently on the stove until hot, but not boiling, allowing the vanilla bean to infuse. Remove from the heat and discard the vanilla bean. Meanwhile, whisk the egg yolks, caster sugar and cornflour together until pale and creamy. While still whisking, pour hot cream into the egg yolk mixture in a thin stream, and continue whisking until combined. Return mixture to the pot and heat gently on the stove, while stirring, until thickened. 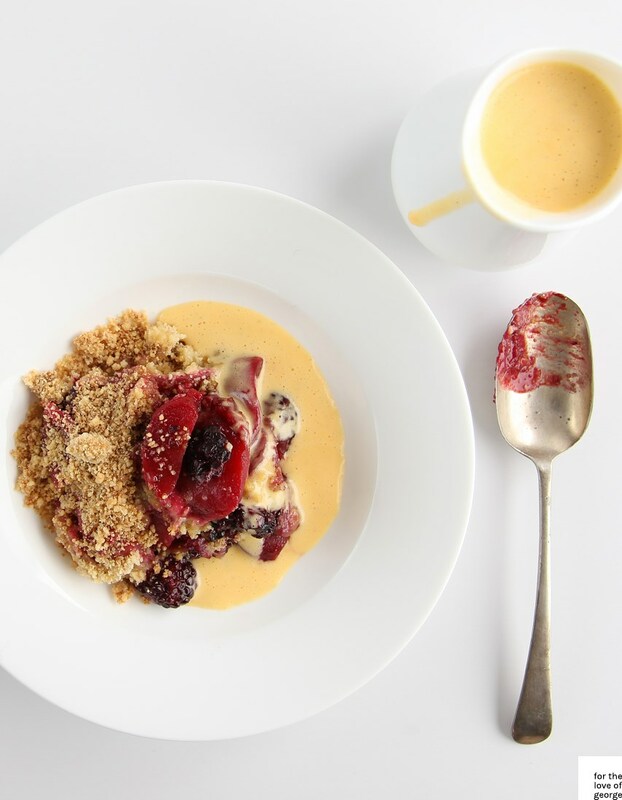 This entry was posted by Lauren (blog author) in Food and tagged anglaise, apple, blackberry, crumble, custard, dessert. Oh my deliciousness! Granny Pig as the source of your craving did make me laugh out loud, I must admit. But this. Oh, yes. I shall be baking it. Now I am glad I found this recipe. Thanks!